The key to eating well in Venice is to eat like a Venetian. That means you should both eat where the locals eat and try to eat locally produced foods. In spite of Venice' poor reputation for food, there really is lots of great food to be had here for those who know where to find it. Here, OG Venice will introduce you to some of the best local-favorite restaurants and speciality food shops in Venice. “Cicchetti” is often translated as meaning “snacks”, but Venetian ciccheti is really so much more than that! Cicchetti are small portions of almost any kind of food ranging from small open-faced sandwiches, called “crostini”, with cured meats, cheeses and vegetables, to fried zucchini flowers, to myriad seafood and pasta dishes. Almost anything that can be served in a meal-sized portion can be served in a cicchetti-sized portion. 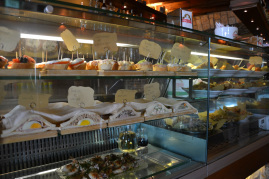 Eating cicchetti is the best way to sample the local foods of Venice and the Veneto region. 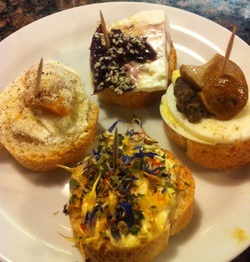 Almost every bar, osteria, enoteca and restaurant offers some kind of cicchetti. And, most pieces of cicchetti cost less than two euro. That's right! It's not only the best food in town, it's also budget-friendly. There is a Venetian tradition, known as a “Ciccheti e Ombra” tour. (“Ombra” translates to “shadow” or “shade”, but in the sense used here it means a glass of wine.) Simply put, the participants traverse the city sampling ciccheti and drinking wine along the way. 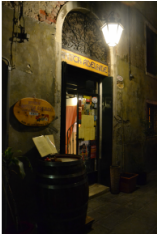 Taking a ciccheti e ombra tour is a fantastic way to explore the city and taste some local flavor at the same time. Buy take-away foods that are convenient to eat while standing and walking and that won't leave you stranded in the street with a handful of packaging to dispose of. Since the year 1097, the Rialto Market has been the main fish, fruit and vegetable market in Venice. Even if you are not in a position to cook for yourself, the Rialto Mercato is a must-see sight of Venice. There you will find a huge and beautiful fish market brimming with live catches and exotic varieties as well as a green market offering a rainbow of fresh fruits and vegetables, some from the Venetian island of Sant'Erasmo, all nestled into two squares on the edge of the Grand Canal. The area is surrounded with specialty food stores and also dotted with excellent restaurants. Don't miss it! 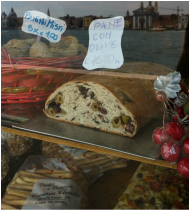 Finding great baked goods can be one of the biggest food challenges in Venice. There's no one area of the city chalk-full of bakeries. But there are some really wonderful secret little bakeries and pastry shops in town. If you like fresh baked goods, maybe even the occasional cake, it is well worth making the effort to find them. You may be able to buy a scoop of gelato on every corner, a biscotto in any cafe and a bottle of wine in every botega, but you won't have tasted the best of Venice before you've had a sorbeto to from Gelateria Alaska, a chocolate from Vizio Virtu and fresh pasta from Pastaficio Serenissima. There are some serious food artists at work in Venezia! Lets go find them! You can always find fresh fruit, vegetables and seafood in Venice. 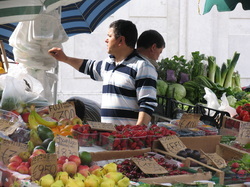 There are hundreds of small open air markets around town. Some markets are large stands in the middle of major campos, others seem to magically grow out of the walls in the narrow streets of Castello and just as magically disappear at night. Searching out these markets can be a great way to supplement both your sightseeing and your food supply while living a genuinely Venetian lifestyle! 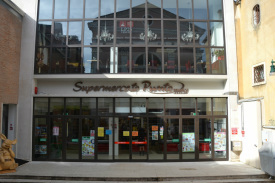 The Venetian population, and Venice' millions of visitors, are also served by several chain grocery stores and several smaller convenience shops. In fact, while 20 years ago supermarkets were few and far between in Venice, the city is now practically bursting at the seams with them. You can find lots of snacks, bottled water, wines and liquors as well as everything you might need for cooking at home in these stores. Some of the grocery chains operating in Venice are a listed below. You can find the stores in the neighborhoods I mention below, or follow the links to their store-locator pages. InCoop. 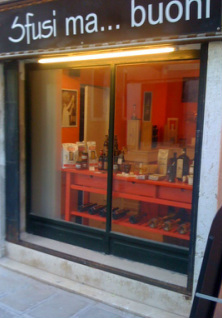 inCOOP stores operate small supermarkets throughout venice. With the exception of some larger stores, they do not carry too many meats or fresh vegetables. Nevertheless, an inCOOP store is a great place to find pastas, water, milk, eggs, cheeses and other snacks and foodstuffs that you may need. In the narrow streets of every neighborhood of Venice you will see small shops full of barrels of wine. These are Sfuso wine shops. Sfuso is the term for wine that has not yet been decanted into glass bottles. In a Sfuso store you can buy wine by the liter or the half-liter. It will be dispensed into a plastic bottle, or you can bring your own bottle. 1.5 liters of sfuso generally costs you between 3 and 5 euros. Though unglamorous in their presentation, Sfuso wines are the same local wines that you would buy by the bottle in a grocery store or drink in a bar. Many of them are quite good and the prices certainly can't be beat. As a bonus, there is almost always a tasting going on in the sfuso shops. 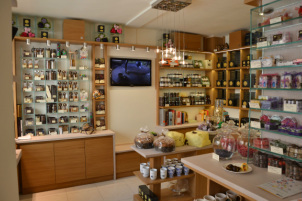 TRICK: Some Venetian Sfuso shops, such as Sfusi Ma Buoni (On Rio Terra De Cristo, near San Marcuola﻿), stock other hard-to-come bye Veneto region goodies as well. These can include bottles and jars of specialty sauces, cured vegetables & patees. All of these go well with any snack platter that you might be planning to put together at home!